I spend a lot of time babbling about craft beer here. There's a lot to talk about between opportunities to kick Budweiser to the curb when they launch a new bad beer. Once in while I see something on my travels that makes me realize my search for the holy ale sometimes has blind spots. On my way to last night's Collaboration Brewers dinner at Laurelwood, I stopped in down the street at Gustav's. There are reasons for everything and the reason I went into Gustav's is that I arrived at Laurelwood too early and they weren't yet open for the dinner. Gustav's is a few short steps away. Viola! You need to know I have a reference point with respect to Gustav's and its affiliated restaurant, the Rheinlander. I once lived a block away. This was in the mid-nineties. There were no brewpubs nearby, as there is now. We would often walk down to Gustav's for a beer and sometimes a snack. The beers there have always had a German flavor. Go figure. Spaten is practically a house brand and has always occupied at least several taps there. Back in the day, Gustav's also had a selection of Northwest craft brews on draft. Beers like Widmer Hefeweizen, Deschutes Mirror Pond...you get the idea. This was true as recently as a couple of years ago. I wasn't really shocked to see that they no longer have any craft beers on tap (there are a few available by the bottle). 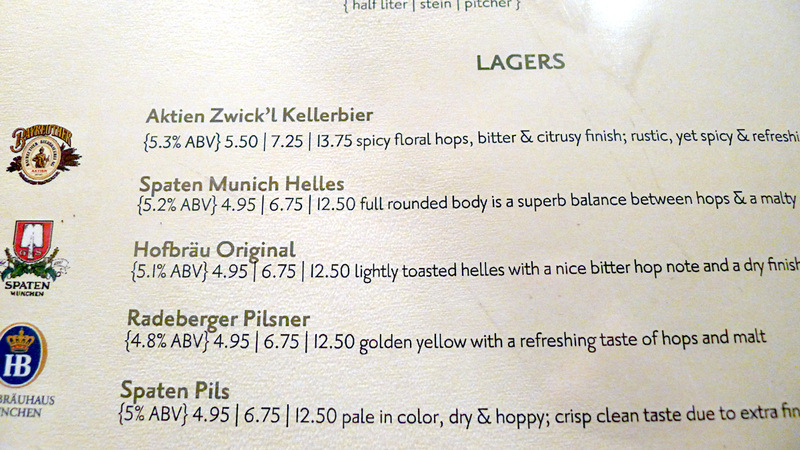 Instead, they have dialed their selection more deeply into German beers. There were no fewer than 17 tap handles, all of them occupied by German beers: Helles, Pilsner, Kellerbier, Ocktoberfest, Dunkel, Wiessbier and so on. Make no mistake. These are amazing beers. I ordered a taster tray of four beers: Kellerbier, Munich Helles, Hofbrau Original (another Helles style) and Spaten Optimator, which I've always liked. Every one of these beers was excellent...and refined. 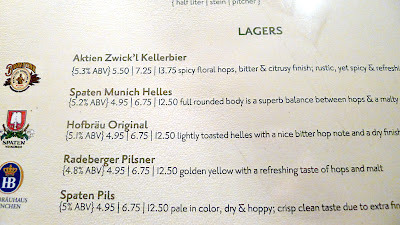 I particularly liked the Kellerbier. Why am I bringing this up? Because I think our rabid pursuit of unique craft beers in and around Portland sometimes obscures the fact that there are other terrific beers out there, beers that have often been brewed and refined over centuries. I know, I know...these beers aren't local, and local is definitely important. But still. I salute what Gustav's is doing. 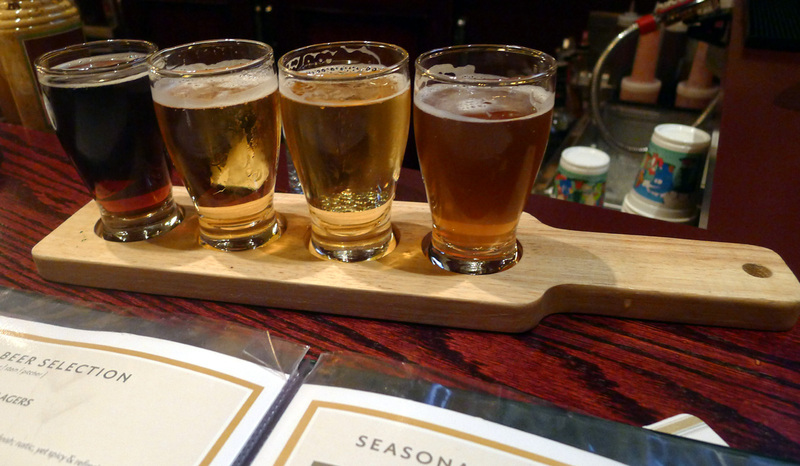 Why should they compete with the brewpubs and pubs? They're smart to offer an alternative. Oregon's craft beer industry is still in its youth and it has borrowed extensively from what brewers in Europe have been doing for centuries. The German connection, a piece of it, anyway, is on display at Gustav's. Good for them.